Las Olas River House sits right on the New River just a block away from the Las Olas Blvd shopping and restaurant district of downtown Ft Lauderdale. The 42 story tower is the tallest in Fort Lauderdale creating some of the most amazing views in Fort Lauderdale Real Estate. 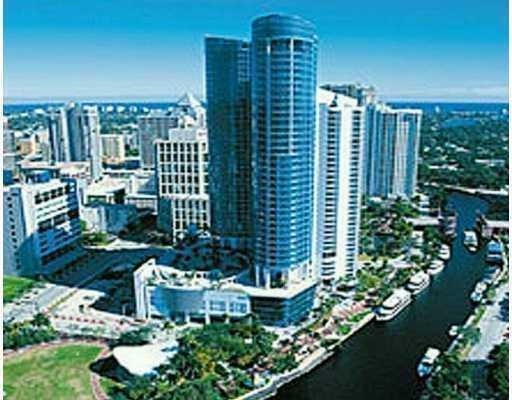 Read more about Las Olas River House. Las Olas River House is one of the newer Fort Lauderdale Condominium buildings and boasts numerous ammenities, creating a resort style Ft Lauderdale Condo. Las Olas River House residents are at home with a 60,000 square foot landscaped garden with pool and spa, a putting green and private poolside cabanas. The gleaming tower of Las Olas River House features a spa center with salon. The property is all about 5-star service including round the clock staff, doorman, valet, a private dinning room, library, bistro and piano lounge. Las Olas River House is the Ft Lauderdale Condo to visit if you are seeking an urban lifestyle, with a resort feel in todays booming downtown Fort Lauderdale. There are 8 differant floor plans at the Las Olas River House from the 1161 square ft Soho which makes a perfect Ft Lauderdale second home, to the incredible Park floorplan at 3239 square feet and an additional 600 square feet of balcony. Every luxury Ft Lauderdale Condo at the River House features a view of downtown Fort Lauderdale, or the New River and as you rise above the 16th floor the ocean horizon turns into a panoramic view of all of South Florida. Eric Miller and Associates, are always available to help you buy or sell Ft Lauderdale real estate in the Las Olas area and will be happy to show you Las Olas River House. You can Contact us directly at (954) 383-8170. Starting your search for a Fort Lauderdale Beach Condo, visit some great properties you may find of interest.